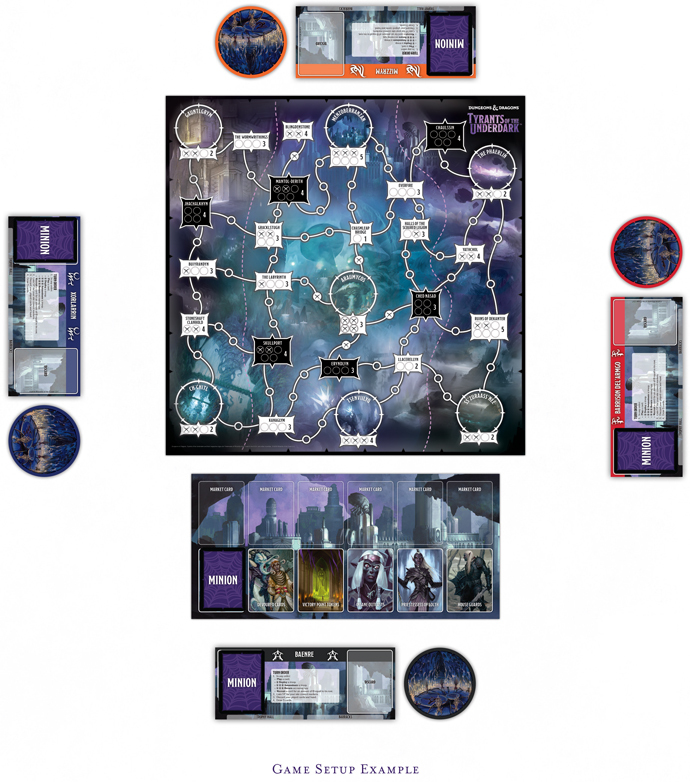 Tyrants of the Underdark™ is a competitive strategy game for 2 to 4 players in which you take on the role of the leader of a drow house. As a drow (a dark elf) your goal is ascension to greater power through control of the Underdark. During the course of the game, you’ll build and play your own deck of cards that represent the minions of your house and determine what actions you can take on your turn, such as recruiting new minions or deploying troops to the game map. You’ll continually refine your deck, adding new cards while removing others to make your deck more powerful. 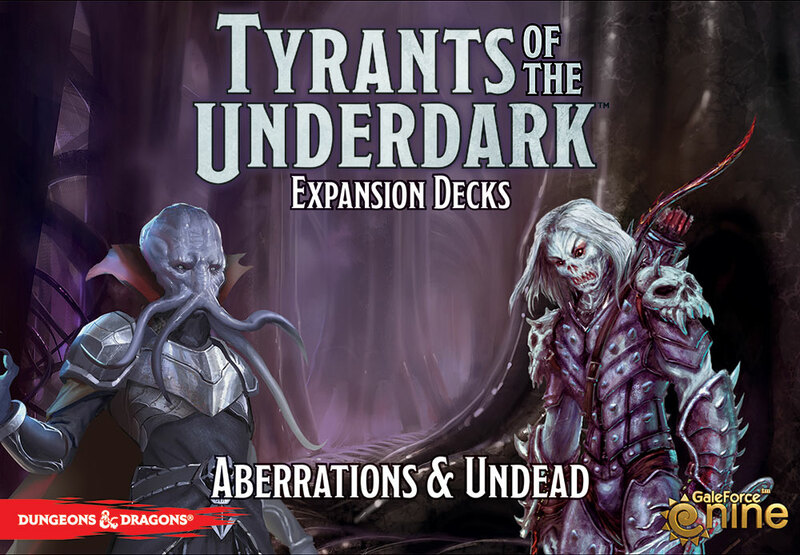 Earn victory points (VP) by recruiting powerful minions and controlling important locations in the Underdark. The player with the most VP at the end of the game wins. 1. Place the game board within easy reach of all players. Depending on the number of players, you’ll play on the entire game map or only part of it. The board is divided into three sections by a dotted line. • 2 Players. Don’t play on the outer sections; play only on the center section. • 3 Players. Choose one of the two outer sections; play only on that section and the center section. • 4 Players. Play on all 3 sections. 2. Choose 2 of the market half-decks (40 cards apiece) and shuffle them together to form the market deck. Put it face down in the marked space on the board. 3. Put the Priestess of Lolth and House Guard cards face up in their marked spaces on the board. 4. If you’re playing with the Demons half-deck, put the Insane Outcast cards face up in their marked space. 5. Put the top 6 cards of the market deck face up in the market. 6. Put white (unaligned) troop pieces in all troop spaces marked with crossed swords on the portion of the game map you’re playing on. 7. Put the site control markers in their marked spaces on the game map with the “total control” side face up. 8. Place the VP tokens in the marked space on the board. 9. 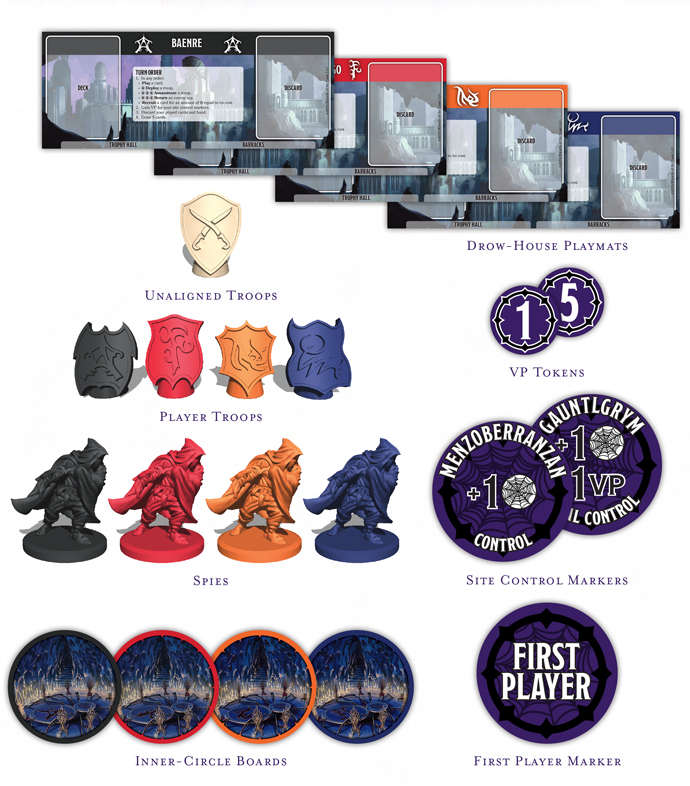 Randomly choose who will take the first turn and give that player the first-player marker. • Choose a drow house and take the playmat, inner-circle board, and all pieces of that house’s color. Place them in front of you. • Take 7 Noble cards and 3 Soldier cards to create your own starting deck. Shuffle your deck and place it face down in the marked space on your playmat. • Draw 5 cards from your deck. 11. Starting with the first player, each player deploys a troop in any starting site on the game map not already taken by another player. Starting sites are those with black boxes. 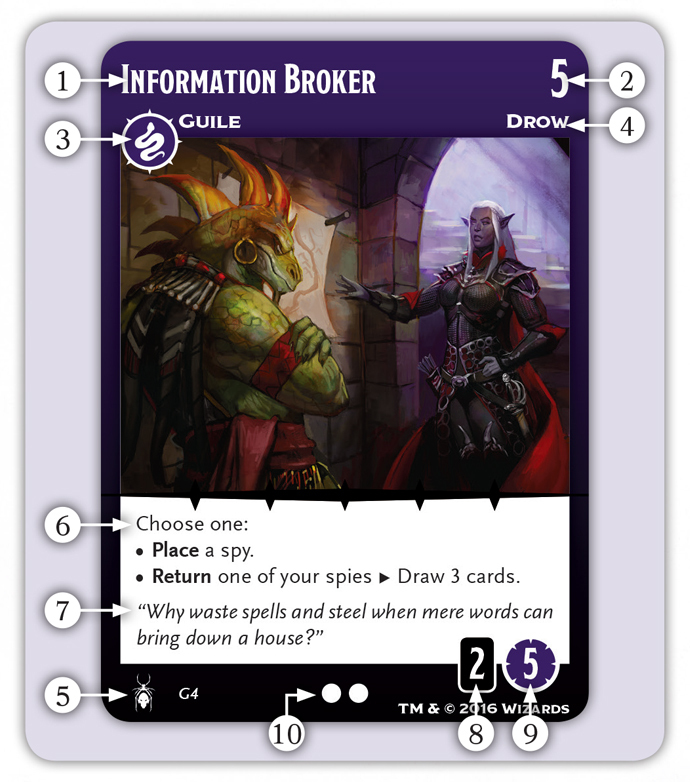 The cards in your deck represent your minions, individual members of your drow house that will do your bidding. 2. Cost. How much Influence you must expend to recruit the card. 3. Aspect. Minions represent different aspects of drow society, as shown by their card symbols. 4. Minion Type. What type of creature the minion is. 5. Deck Symbol. Which market half-deck the card belongs to. 6. Rules Text. What the card does when you play it. 7. Story Text. Gives some insight into the minion’s story, but has no effect on gameplay. 8. Deck VP Value. How many victory points the card is worth in your deck, hand, or discard pile at the end of the game. 9. Inner-Circle VP Value. How many victory points the card is worth in your inner circle at the end of the game. 10. Rarity. How many times you’ll find the card in a half-deck. For example, a card with 2 dots has 2 copies in its half-deck. Want to know more? 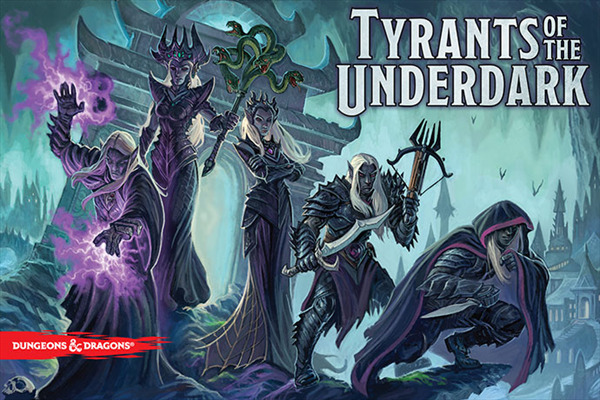 You can a find the a Tyrants of the Underdark article written by developers Yoni Skolnik and Andrew Veen here on the web, and if you haven’t yet downloaded the Dragon+ magazine mobile app, you can go here for Android or here for iOS.